High dose of Vitamin D3,which is also called sunshine vitamin in a optimal dose. A true elixir of life. In an ideal world you could spend all day in the sun and thus naturally take care of the level of vitamin D3 in the body. Unfortunately, in our country it is rather impossible. But fortunately we have supplements. Deficiencies of vitamin D3 in our climate are very common, so regular supplementation should be a part of taking care of our own health. According to the manufacturer's suggested dose is 1 tablet per day. It amounts are a little understated. Adults, the elderly and obese should increase the dose to 2 or 4 capsules per day, at least during the period from September to April, when the sun is the least and the natural synthesis of vitamin D-3 is inhibited. Vitamin D3 is fat-soluble, so it must be taken with a meal containing fat. 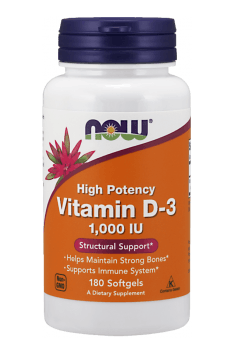 Vitamin D3 combined with vitamin K2. This prevents osteoporosis.